LONDON, (Reuters) – Sri Lanka Cricket will lodge a complaint with the International Cricket Council (ICC) against an “unacceptable” reprieve for England batsman Alex Hales in the third and final test at Lord’s, SLC president Thilanga Sumathipala has said. Alex Hales is bowled by Nuwan Pradeep of Sri Lanka who was later adjudged to have overstepped the bowling crease but television replays showed that the delivery was a legitimate one. 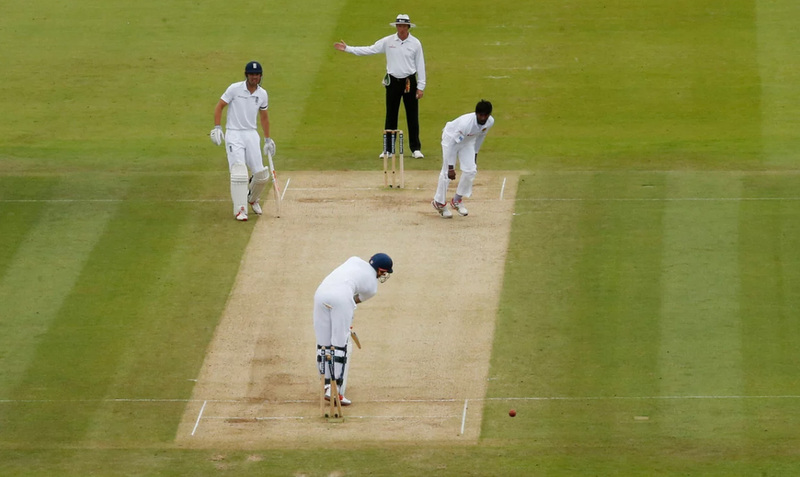 Nuwan Pradeep clean bowled Hales, then on 58, in England’s second innings on Sunday but it was adjudged a no-ball by umpire Rod Tucker, even though replays suggested a fraction of the paceman’s shoe was behind the popping crease. Hales capitalised on the reprieve to score 94 before he was finally dismissed but his reprieve prompted the visitors to briefly unfurl a Sri Lankan flag from the balcony in a perceived mark of protest. “The management on tour is very sad about that decision and it will be reported to the ICC,” Sumathipala, who termed it “unacceptable”, said. Coach Graham Ford, who complained to match referee Andy Pycroft after Sunday’s play, played down the unfurling of the flag by the team, who have already surrendered the three-test series after crushing defeats in Leeds and Durham. The SLC chief, however, saw it differently. Ford said Tucker had apologised for the mistake and the coach was of the view that front-foot no-ball calls should be taken out of the on-field umpire’s hand. “It just seems strange that with the technology that is available you can get a line call wrong,” Ford said. Meanwhile, England paceman James Anderson was reprimanded for “conduct that is contrary to the spirit of the game” during the match, the ICC said in a statement. Anderson was guilty of showing disrespect to umpire S Ravi, who had asked the paceman not to verbally engage with Sri Lankan batsman Rangana Herath during the visitors’ first innings. Sri Lanka resume Monday’s final day on 32 for no loss, needing 330 more runs to salvage some pride in the series in which they have been thoroughly outplayed.